During the days when drafting was done by hand, neat lettering could be done using a Leroy lettering set made by Keuffel & Esser. 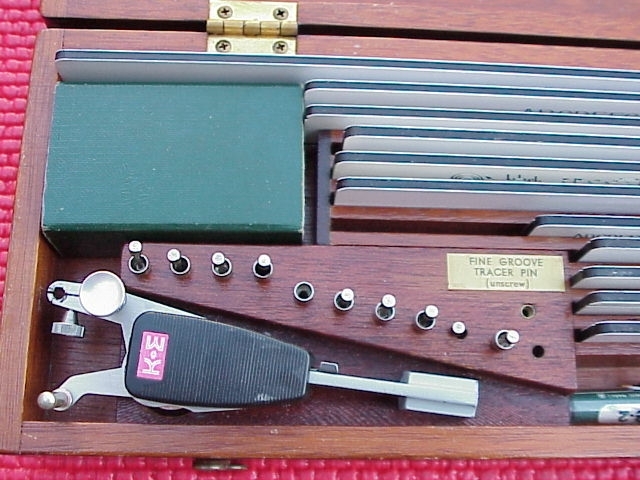 Probably every drafting department had one or more of these sets. * Not part of the stock Set. The dash number of a template is the normal character heights in thousandths of an inch so this set covers 0.080 to 1/2" high letters, or you can think of the size number as "points" where one point is 1/10 of an inch. 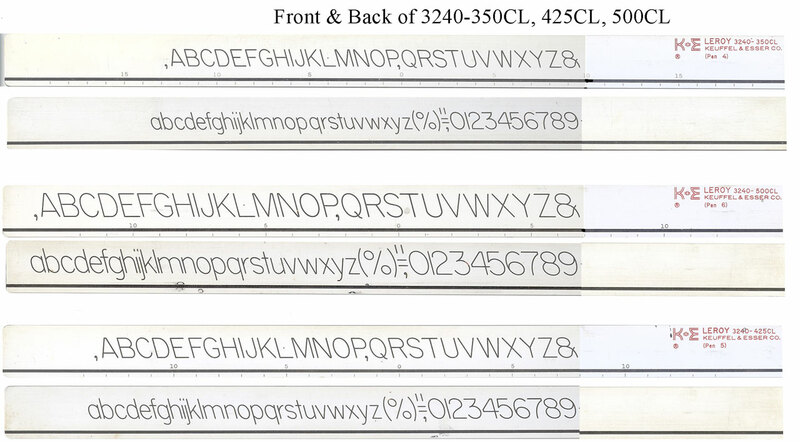 The 3240 series templates are the Standard Lettering Templates. Most templates are double sided. Template model numbers ending with "CL" have both Capital and Lower case letters and the numbers. Templates with model numbers ending with "C" have just the Capital letters. The "L" models are Lower case letters only. Some of the other templates have a "P" prefixing the other letters, don't know what it stands for. 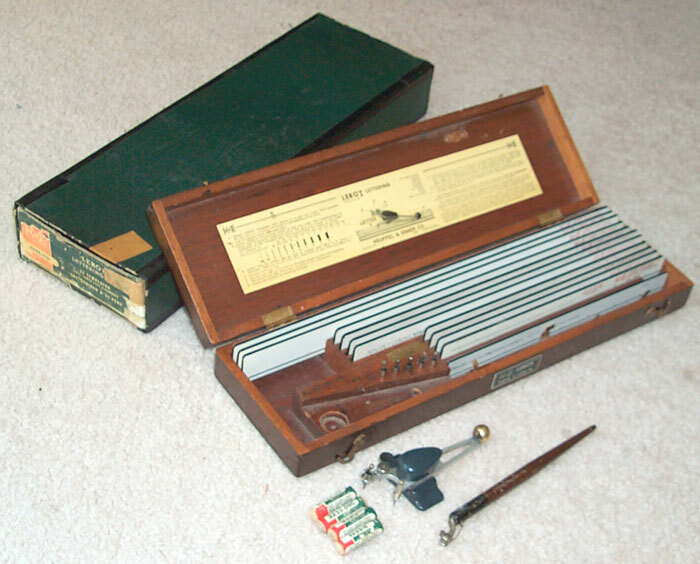 Alternate Scriber design - Vintage or features? D127962* Lettering Scriber April 1, 1941 D19/41; 33/23.04 - looks exactly like the scriber in my set. D141675 Symbol Template June 26, 1945 D10/64; 33/23.04 - Template with electrical circuit symbols, shows two, one only has a partial groove? * Marked on the bottom of the Adjustable Scriber 3237-2. Including postage to U.S. mailing address and CA sales tax if you are in California. These manuals are NOT on my CDWM. 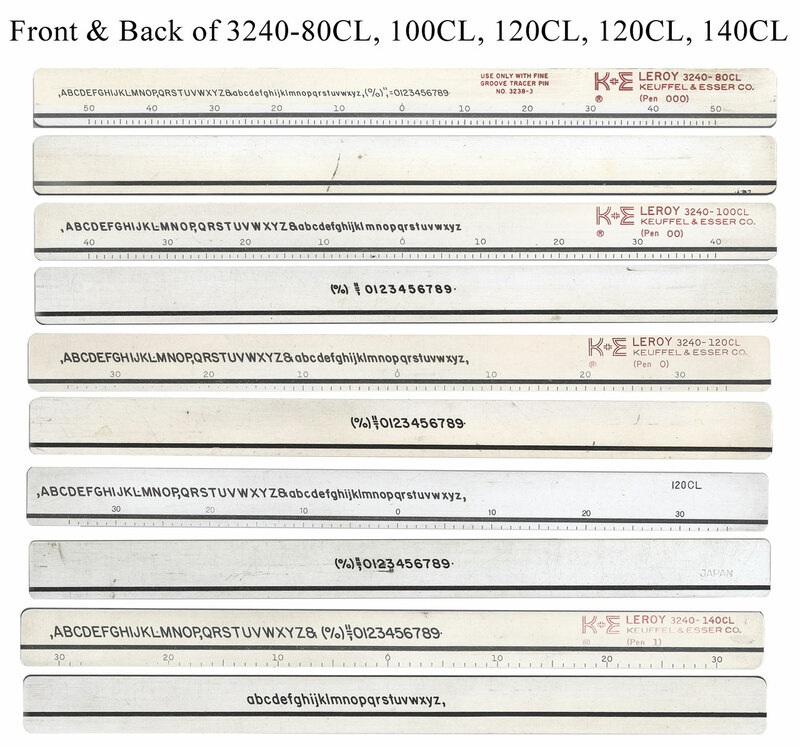 Consider getting the package of K&E doucments by ordering the 1928 Catalog. page created 5 June 2003.